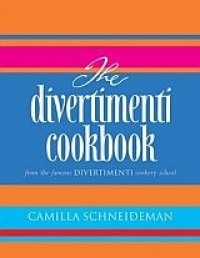 Divertimenti Kitchenware Shop was opened in Brompton Rd in 1965 by Camilla’s parents, bringing to post-war London quality cooking utensils and beautiful tableware. In 2001, at the newly opened Marylebone High Street branch, Camilla started cookery classes, gaining an understanding of what people wish to cook, what dishes and procedures intimidate them and where confusion sets in when cooking dishes for the first time. In this book she shares her knowledge, giving tips and shortcuts as well as a repertoire of dishes that are simple and stunning. She introduces unusual ingredients, answers most often asked questions, and gives advice on equipment. Many of the dishes can be prepared or even cooked well in advance – chicken roasted in white wine, garlic and herbs, Persian chicken with pomegranates and walnuts and red duck curry, her dad’s famous steak and chips, slow cooked lamb shanks with tamarind and dates and simple elegant fish dishes. There is a wide selection of desserts ranging from an orange steamed pudding with thick vanilla-flecked custard and hazelnut meringues to a chocolate mousse with a perfect balance of bitter-sweet.